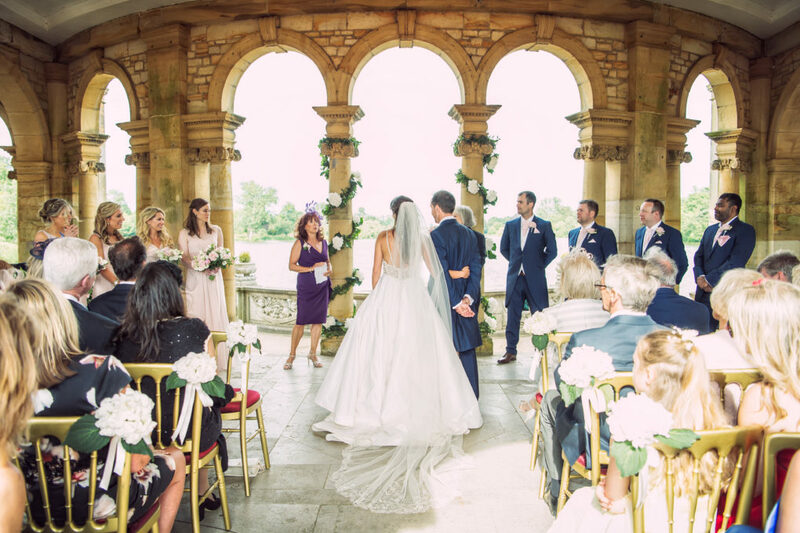 An Italian Garden Wedding at Hever Castle gives the feel of an Italian style wedding, without having to travel to Italy! The stunning surrounds of the gardens are truly spectacular, utilising the lakeside ‘Loggia’ for a ceremony and The Guthrie Pavilion for the wedding breakfast and evening reception. It is, therefore, a magnificent area of the gardens, designed to display William Waldorf Astor’s fine collection of Italian sculpture. Summer months see the Award Winning Italian Garden come to life. Afternoon wedding ceremonies take place under the beautifully arched columns of the Italian Loggia overlooking the 38 acre lake. This magical lakeside location can also include your drinks reception where guests can take in the views from the stone piazza, complete with our very own Trevi fountain. Afterwards, guests take a short walk through the Rose Garden, on route to The Guthrie Pavilion for a wedding breakfast. Extensively refurbished in Palladian style, The Guthrie Pavilion offers vaulted ceilings and floor to ceiling arched windows. This provides a light and airy atmosphere from day into night without losing the romantic backdrop. The Guthrie Pavilion accommodates up to 180 for a wedding breakfast and an additional 40 guests for the evening reception. Licensed until 1:00am, the Guthrie Pavilion can also host your evening reception accommodating an evening buffet, disco or live band and bar facilities. Italian Garden Wedding ceremonies are available from April through to October, excluding school holidays and bank holiday weekends.